Shipping costs are calculated based on your order and location at checkout. For orders with multiple items, shipping price is reduced. *International orders may be subject to custom/import fees. Customs clearance may cause delays. Since many of these items are prepared just for you, please allow 2-3 weeks shipping time within the US and Canada. International orders often take a couple weeks longer. Expedited shipping is available upon request, but please contact me in advance if you are placing a time sensitive order. All orders are insured and tracked. International orders may be subject to import fees. Customers are responsible to pay the fee. How do I display my print? In order to save you the extra shipping fees, and limit the risks of damage in transit, we currently ship all prints unframed. This also means you call the shots as to how it is displayed to best suit your home. Framing shops will build you a custom frame, or you can find a ready made frame to fit your print. Custom matting will help you print fit ready made frames. Frames can be very neutral or creative; reclaimed wood is a beautiful material for custom framing. For canvas prints, you may chose to have a canvas stretcher built. Most carpenters or professional framers can do this. When you wrap the print, you may chose to wrap some of the image over the border, or line it up to the edge to show a white border. What is the difference between rag paper and canvas? They're both gorgeous. Both are acid free fine art papers that are stunningly accurate to the originals. Rag paper is a cotton based art paper. It is smoother, and colors come out a little bolder. Due to rigidity of the paper, you'll need to flatten it down a bit once removed from its roll. Canvas has subtle woven texture to it and is more durable. It is primed, so the ink sits smoothly on top. This tends to be the favorite option, because canvas is just plain awesome. Yes, originals are sometimes available. To see what originals are available, feel free to send me an email! Though my focus is primarily on personal work and projects, I am open to working on projects that align with my passions and interests. If you have a project or commission you'd like to hire me for, please email me to discuss. If you’re not completely satisfied, email us to arrange a return within 14 days of receiving the piece. Once the item is returned in good condition, we can refund its cost. All shipping charges are the responsibility of the buyer. All items are insured. If the product was damaged or lost in transit, you will receive a replacement. 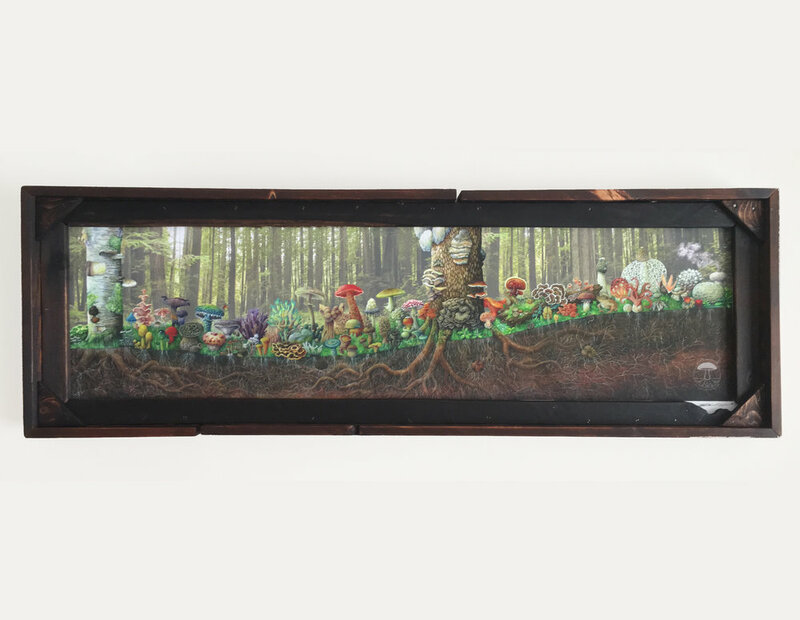 Hand made frame using reclaimed wood.